Have you gotten your new shoes and bags for CNY? 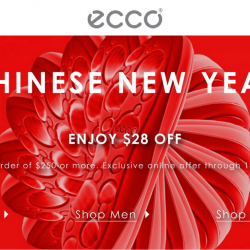 Enjoy $28 off your order online at ECCO Singapore from now till 18 February 2018! Valid with orders above $250. Get free local shipping with orders above $99. 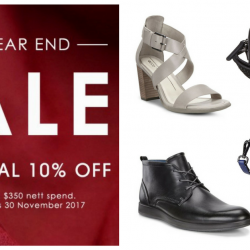 Till 30 Nov 2017 ECCO: Year-End Sale with Additional 10% OFF Your Order Online! 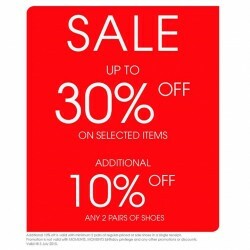 ECCO's year end sale is now on! Enjoy an additional 10% off your order on top of sale items till 30 November 2017! Get new shoes and bags now! Free shipping above $99. Last day! ECCO: Friends & Family Sale with 25% OFF Regular-Priced Items + Extra 10% OFF Sale Items In Stores & Online! 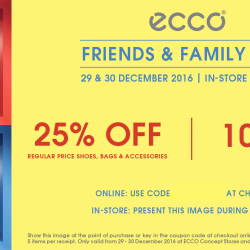 ECCO invites you to celebrate with Friends & Family Sale! Today is the last day, dun miss it! Happening at all ECCO Concept Stores and ECCO Online Store, enjoy 25% off regular-priced shoes, bags & accessories + extra 10% off sale items! Present below image in stores during payment or use promo code when you shop online. 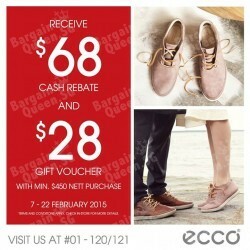 Don’t miss out on this special deal happening at all ECCO stores! Receive this exclusive foldable travel luggage when you spend $450 and above. Promotion is valid till 31 July 2016, while stocks last. 3 DAYS ONLY!!! Sale items included. The wait is over, we are starting our Great Singapore Sale TODAY! 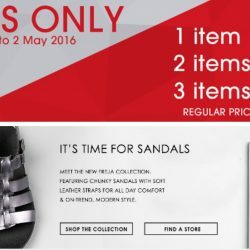 Get their shoes at their sale now up to 20% off regular price shoes and bags till 2 May 2016! 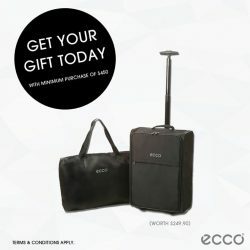 Ecco offers free standard delivery on all orders above $99. A delivery fee of $14.98 will be imposed on orders below $99. The Lunar New Year is just round the corner, get your pair of ECCO shoes today. Promotion is valid online and in stores till 28 Jan 2016. They heard you! Enjoy the extended promotion in their Concept Stores or e-store. Terms and conditions apply. Promotion is valid till 15 Nov 2015 or while stocks last. 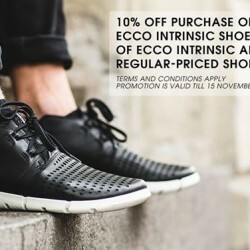 Till 18 Oct 2015 ECCO Shoes: Online Exclusive on Shoes and Bags @Save 10% OFF. 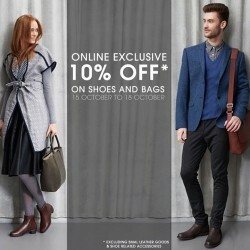 Enjoy ECCO Shoes offers Online Exclusive on Shoes and Bags 4 DAYS ONLY There is no reason to wait anymore. Term and Conditions apply. here. 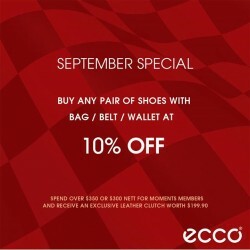 Grab ECCO Shoes offers and Don’t miss their exclusive October offer, starting today. Terms apply. Pick your favourite! 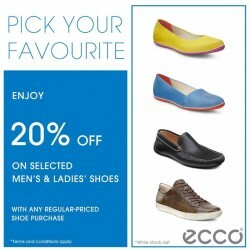 Enjoy 20% off on selected men’s and ladies’ shoes with any regular-priced shoe purchase @ ECCO Shoes. Terms and conditions apply. For a pair of good quality shoes, definitely go to Ecco, who is one of the few major shoe manufacturers in the world to own and manage every step of the shoemaking process thus able to control the quality of each shoe. 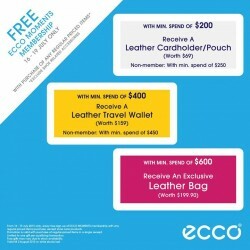 With minimum spend of $200 receive a Leather Cardholder/Pouch (worth $69). Non-member: with minimum spend of $250. With minimum spend of $400 receive a Leather Travel Wallet (worth $159). 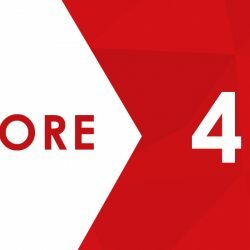 Non-member: with minimum spend of $450. With minimum spend of $600 receive an exclusive Leather Bag (worth $199.90). Now who doesn't love a pair of stylish yet comfortable shoes that can bring you anywhere and everywhere? Do you know that ECCO is probably the world’s only major shoe company that owns and controls the whole shoemaking process from hide to High Street? From design and leather craftsmanship to production, quality testing and sales, ECCO controls every step of the shoemaking process, ensuring the high ECCO quality.